"Sharing The Best Within Me"
that challenge your perspectives and perceptions. conveying thought, expressiveness, character, and mood. as well as the protector of those traveling up the Mississippi River to freedom. October 6th. The exhibit wil also feature African-Dance by the Dimbayaa Dance Company. to India, the colors, and henna designs are incorporated in some of her artwork. Entertainment and hors d'oeuvres are available for your enjoyment. Christopher Thomas, Devin Thomas, and the Zuka Arts Guild. Herzog, Farragut, and Barbara C. Jordan Elementary schools. exemplify the types of artistry children can produce. throughout the month of February at the 14th Street Artist Community. with a Bachelors of Fine Arts and Master of Fine Arts in studio and art therapy. through my creations I reveal my internal world". Jazz Pianist James Matthews Performs 7 - 9pm.
'' A Little Bit of Rhythm and Blues "
Jazz Pianist James Matthews Performs 7 - 9 pm. and Botswana. I traveled widely, on my own, throughout the continent - living on love and fresh air. With gratitude, I offer large scale paintings on cloth and photographs of daily life in Ghana and Botswana." "I find my inspiration from the vivid memories, experiences and my curiosity in people. As a child, I was fascinated with the work of Romare Bearden and the early 20th century of art and music, the civil rights movements, all of it was such a seduction for a child growing up in the sixties. These things touched me deeply and as my talent grew, I found myself naturally drawn to the imagery with a tremendous challenge as I started to record them in the drawing of my childhood and later as a professional illustrator. I have had many group and solo exhibitions in the Midwest and my work has been published in national and independent magazines. My pieces portray the good and the bad, happy or sad elements of life and sometimes , the complex subject matters of the persecution of races, religions and the minority groups that are tackled with the utmost of sensitivity. To communicate the message of tolerance and understanding is imperative in my pieces. entertaining people with his steel drums. He is an artist, musician, and an artisan. Mixed media and sculpture hold a special place in his heart due to their three- dimensional form, which provide emotional and spiritual contact, especially when using organic material. 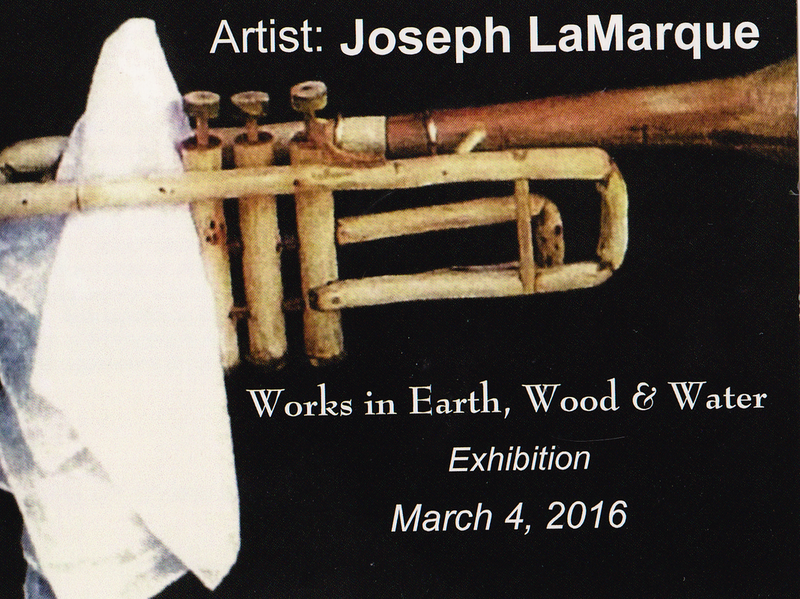 Joseph LaMarque is an established artist who continues to find excitement in new expressions of art and enjoys sharing his knowledge with others.